Public Transport can be more convenient, quicker, and cheaper than travelling via car and provides environmental benefits too. Car journeys contribute a significant amount towards our overall carbon footprint. 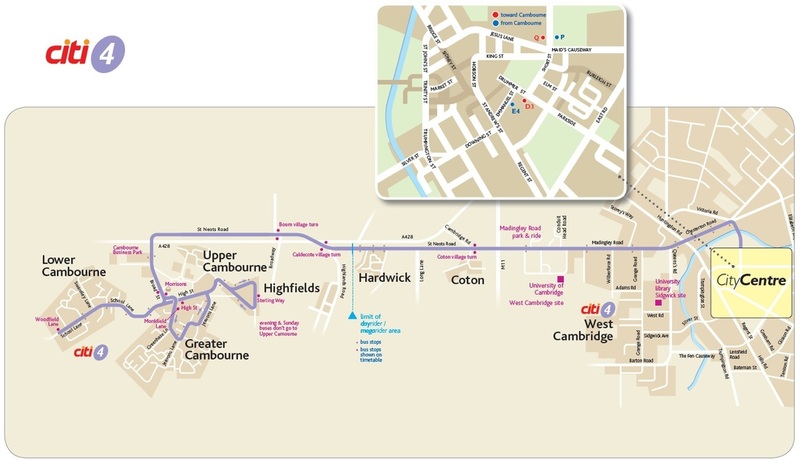 Public Transport allows you to reach a central point such as Cambridge directly rather than getting on a one-way system or diverting via a car park. You also get the benefit of relaxing with a newspaper or using a portable media device. Public transport can also be quicker, especially as more investment is made into the public transport network. If you regularly travel the same journey or planning in advance you can make cost savings as the cost of running a car is more than just the cost of petrol. Public transport means no car insurance, tax, MOT or car maintenance. Finally public transport does not require looking for a parking space upon arrival at your destination or the expensive cost of parking. Details of public transport services which can be accessed from the site are set out below. There are a number of buses that stop close to the site. Local bus stops are shown on the map below. The bus stop map has been extracted from the www.cambridgeshirebus.info site, which can also be used to access real-time bus information by clicking on the bus stop of interest. The Services within Cambourne and the bus stops are shown on the map below. All Stagecoach buses in Cambridgeshire, including the Citi 4 and 18 services, operate with wheelchair accessible buses which have ramps, an official space for wheelchairs and a low floor capability which enables the bus platform to lower to the kerb level for easier boarding. Whippet Coaches are working to upgrade all of their fleet to wheelchair accessible services. It is important to ring (01954 230011) prior to your journey to identify the services that are wheelchair accessible as not all buses currently are. The Huntingdon Associate for Community Transport (HACT) buses are wheelchair accessible services and can carry up to four wheelchairs at one time. As part of a governmental scheme initiated by the Department for Transport free off-peak local bus travel is provided to eligible older and disabled people anywhere in England. You can qualify for a Concessionary Bus Pass if you are the state pension age of a female or if you satisfy the disability eligibility criteria. The concessionary bus pas may also be used on certain Dial-A-Ride services to give you a 50% reduction off the fare. In terms of rail, services operating out of both St Neots and Cambridge railway stations enable direct and frequent services to London, Birmingham, Ipswich, Kings Lynn, Peterborough and Stanstead. Cambridge Railway Station is approximately a 45 minute bus journey from Cambourne and St Neots is approximately a 70 minute bus journey from the site. The Table below shows the destinations, peak frequencies and journey times for direct services operating out of Cambridge and St. Neots railway stations together with interchange destinations. Cambridge and St Neots railway stations provide a helpline number (Cambridge: 0800 028 28 78 / St Neots: 0800 058 2844) for passengers with accessibility needs to call before accessing the stations. Both stations provide lifts between platforms and ramp access onto the trains as well as wheelchairs available to borrow. Members of staff are also available to assist at the station.